Little orphan Rani lost her foster parents during the Great Darkness War on Daxam in the year 3082, leaving her an orphan for the second time. Booster Gold vowed that Rani would not befall the same fate as her slain companions and parents, going so far as to provide her with a temporary home in Rip Hunter's Time Lab. Ronald Reagan was a Hollywood actor who was elected the 40th President of the United States of America in 1980. 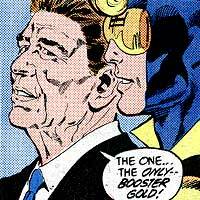 Booster Gold's very first adventure was the prevention of the assassination of President Ronald Reagan and his Vice-President, future President George Bush. Following the incident, Reagan publicly rewarded Booster with a medal and introduced him to both his wife, Nancy Reagan and the world. Booster would later come in close contact with Bush's successor, Bill Clinton, and his wife, Hillary Clinton, at the funeral for SUPERMAN. Reilleau Towers is located at 666 Sixth Avenue in the Business District of Metropolis. Named for its original financial backers, the Reilleau brothers, Reilleau Towers has housed many businesses over the years. The top two floors of Reilleau Towers housed the headquarters of Booster Gold's Goldstar, Inc. business and Booster Gold's penthouse residence. The first Reilleau Towers building was destroyed by Shockwave (see DIRECTOR OF DEATH). 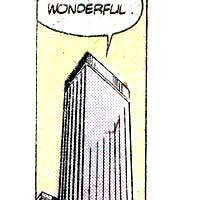 Booster Gold had planned to finance a second Reilleau Towers building, though he was bankrupted by the MANHUNTERS before the project could be completed. It is unclear if the second Reilleau Towers was ever finally erected.